Eating while on the road can be a daunting proposition. As much as I think I want to just walk into any place that advertises food, I find my reality is that I gravitate towards chain fast food restaurants. I know the menus and know the food will taste mostly the same whether I'm in Dayton, Ohio; Front Royal, Virginia; Watertown, Wisconsin; or Wheaton, Illinois. But the thing about chain restaurants, even of the fast food variety, is what works in one region might not work in another. I can think of many chains that came into Chicagoland, seeing a potential for growth, and just died or don't have nearly the number of locations they anticipated they would have. So, I'm traveling in Wisconsin and it's lunch time. I like Hardee's hot ham and cheese sandwich. Hardee's just isn't in the Chicago area. They tried but got no further than the western suburbs, yet, they are all over in the upper Midwest. Culver's was solely a Wisconsin restaurant. Now they have managed to bring that slice of atmosphere, slowly, towards the east and south. There's a Culver's north of me and you get good food at good prices. But, as I got off the Interstate at the exit near work stop number 3, a sign loomed ahead. I knew, immediately, this was where I was going for lunch. As I was waiting, by the beverage dispensers, for my food, the store manager came up to check the quality of the root beer. He thanked me for stopping by. "We make our root beer fresh every day. Sometimes, we have to make more after lunch, but we check the quality up to 3 times a day and throw out a batch that doesn't meet standards." I said I was traveling and, when I saw the sign, knew this was where I had to come for lunch. "I think," he said, "It's because of the frosty mugs." I looked at the root beer in my mug. There was a sheen of ice on the top and a small floating block of frozen root beer just below the sheen. "I would definitely agree with you," I said. "It doesn't get much better than iced root beer." It doesn't. A&W represents the auto and summer vacations spent traveling from here to there. It was a huge treat to drive to A&W and have the car hops bring cold, cold mugs of root beer to the car. It was great when A&W became available in cans and bottles, but it's not the same. There aren't many of the drive-ins around anymore. They've been converted to stand-alone restaurants with drive-thrus. 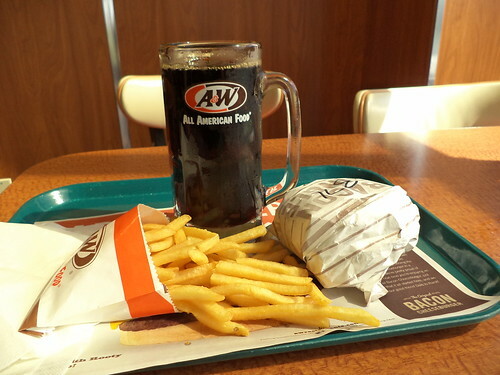 Yet, if you're in the mood for a mug of root beer, A&W is the place to go. I get to go back, tomorrow, to the same location. You can bet THIS is lunch. I like A&W too though I don't get to get there often. We lost our A&W about a year before we moved out here. Always loved the food there too (even after I worked there) .